Innovative actIvItIes on the development of which Russia puts its hopes for the preservation and successful reconstruction of the former USSR applied science are based on three key factors: funding, infrastructure and management. These factors are of equal significance, however, under today's economic conditions in Russian two latter ones become of critical importance. This determines the range of readers to whom the present book is addressed: - representatives of official institutions both Russian and international in charge of technological and scientific sphere reorganization, high-tech industry conversion, market transformations under transit economies; ~ Western experts, lecturers, consultants participating in the implementation of various bilateral and international programs according to the above mentioned directions; - Russian specialists establishing new high-tech enterprises and organizations and corresponding innovative infrastructure. 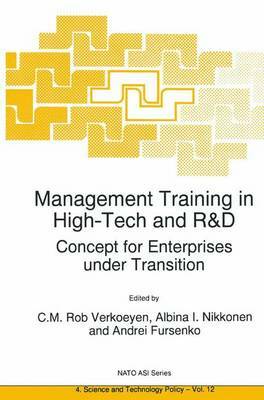 This book brought to readers' attention includes edited presentations at NATO Advanced Research Workshop (ARW) "Concept of Management Training for in High-Tech, Science and R&D" (1-5 July, 1996, St.Petersburg, Russia).